Sam is killing me here with all these different blue plaids. This one has a light counter-colour of either gold or brown that runs through it too. The counter colour roughly falls in four stripes down the vertical front of the shirt, and more along the horizontal. It does up with white snaps. 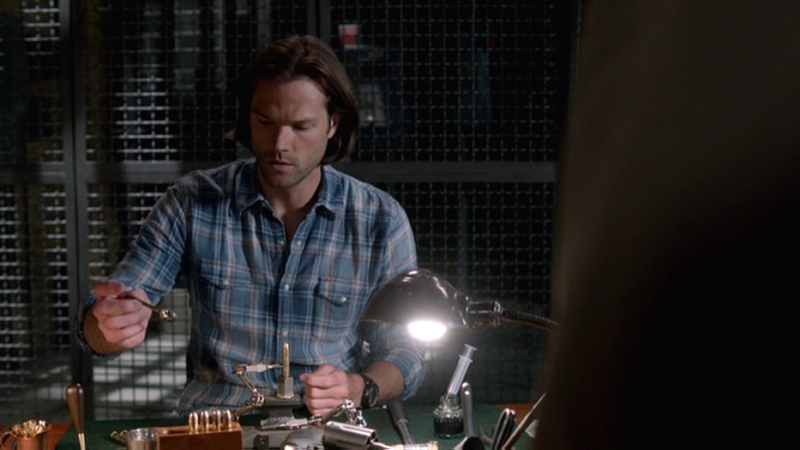 In Brother’s Keeper (10x23), Sam wears this shirt when he is making bullets in the beginning of the episode, and then when he and Cas go to speak with Rowena. He changes into a suit after he gets the call from Rudy about where Dean is. In There’s Something About Mary (12x21), Sam is wears this shirt when they get back from the morgue where Eileen’s body was. He wears it until they discover the microphone in the Bunker and lay their trap for the BMoL. This is a nice shirt. They seem to put Sam in lighter colors and Dean in darker colors. They set off each other nicely that way.